Each of the five Registry categories has a Candidates Choice project. In this you can create a piece of work which fits into the overall category – in this case the category was Construction – with no other constraints. I had the idea for this little pot and the spiked stopper but it didn’t fit into any of the specific projects. So I decided to make it for the Candidates Choice in this category. The texture is a crop circle and I created a tear away texture sheet to use with the clay. The body of the pot was made in two halves. I textured the clay and cut out two circles then dried these on light bulbs to dome them. When dry the edges were refined and the two halves stuck together with a thick snake of clay in the middle. This formed the curved ‘girdle’ of the pot and gave me an area to add a shine to with the textures either side. I created the fluted top separately, then drilled a hole in the top of the body and stuck it in. It extends down inside the pot by about a centimetre. Before setting it into the pot, I carved the lines on it. These exactly match the lines carved into the stopper. 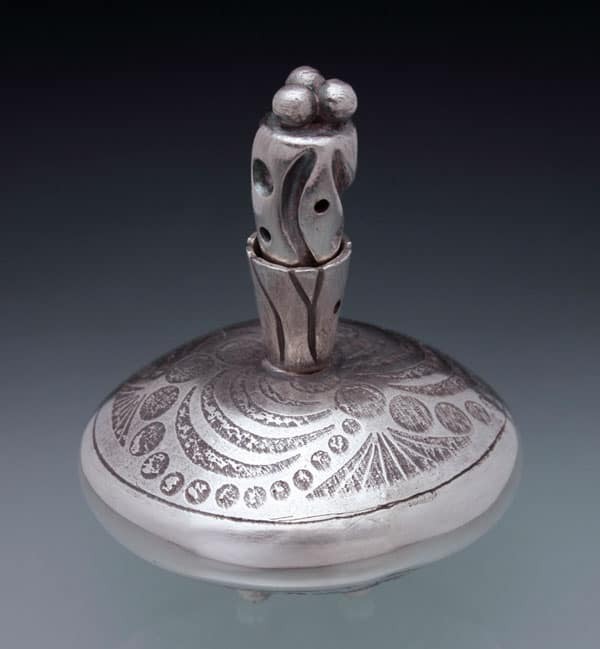 The stopper was made in one solid piece and carved deeply. I was very careful to make sure the carving on the stopper matched the carving on the fluted top because I knew there needed to be a relationship between the two. This point was completely missed by the assessors. The pot is finished with three small ball feet to make it stable and I added three balls to the top of the stopper to match this. After firing the piece had a Liver of Sulphur patina added and was then polished.The pot is 5.5 cms tall from the base to the top of the stopper and 4.5 cms wide. I was disappointed with 8 out of 10. I was very miffed that the relationship of the stopper was missed. This was another example of not being able to tell the assessors information about the piece. This has now been changed and we can provide information on a new form that is enclosed with the submissions. Here are the comments, “Deep grooves in the stopper prevent it from coordinating with the bottle as well as it might have. 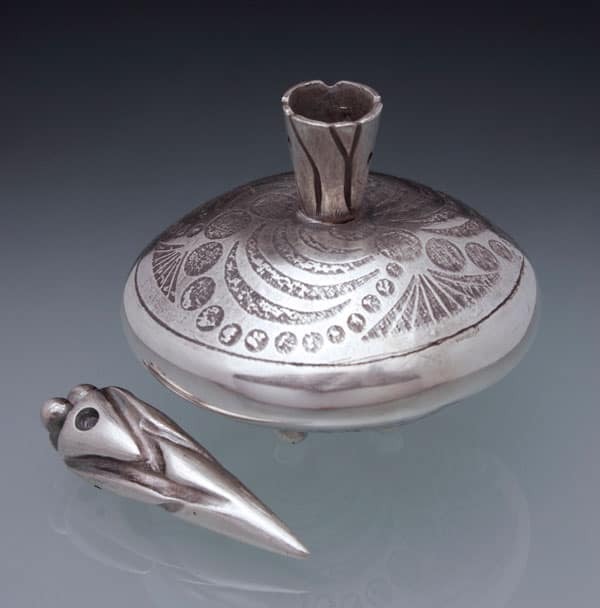 The bottle is graphic while the stopper is sculptural (or formal, as in, relating to form). This is a personal note, but the three balls on the stopper and on the bottom of the bottle are plain and predictable. I wonder what it would be like if they were a different shape, color, or material…” So they missed the connection between the stopper and the bottle. I wonder why they thought I’d put this as one of the criteria if I then didn’t make a connection! On a side issue, one of the benefits of participating in the Registry is that all the submissions are professionally photographed. From the photo on the left, I can see that the photographer didn’t get the connection of the carvings on the stopper with the base. This is a real disappointment and I intend to get this piece rephotographed so the connection is clear. A project of the student’s choice that illustrates skills in construction.